Jessica and Daniel were married at The Barn at Twin Oaks Ranch in October 2014. Their color palette included shades of pastel pink, peach and purple, and their details were timeless and dreamy. This wedding was super romantic! We LOVE it when our couples hire a videographer for their big day! Jessica and Daniel's video, by French Film Co., is so very sweet and beautiful. It's something they'll treasure forever! It captures all the details of their wedding day, as well as the precious memories they'll never want to forget. The bouquets and florals from this wedding were definitely #weddingflowergoals. Jessica chose a mixture of roses, garden roses and dahlias in the prettiest pastel shades - lavender, peach and pink - as well as dusty miller. I can't get over how perfect these bouquets are! The colors, the traditional shape, and the little bit of greenery. Gorgeous! Another one of my favorite details was Jessica's bridal gown! I love the illusion neckline, all the pretty detailing (the lace! the sash! the train! swooooon! ), and the classic silhouette. Such a lovely, timeless bride! This entire bridal party looked flawless. The bridesmaids wore one-shoulder, floor length dresses in the loveliest shade of pale blue, while the groom and groomsmen wore classic (and handsome!) black tuxes. Jessica was the luckiest bride, because she got to have two first looks on her wedding day! The first was with her dad, and it was such a special, unforgettable moment. And her first look with Daniel was romantic and sweet and perfect! It's so obvious how much they adore each other! Jessica and Daniel's ceremony was unique, because it took place on the lawn right in front of The Barn. It was stunning! 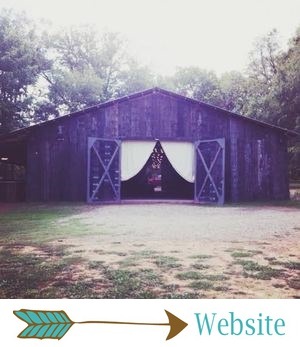 The Barn makes such a beautiful backdrop for a ceremony! Jessica's dad brought an arbor, which they used as their altar... And then they took it home to put in their back yard, so they'll always be reminded of their wedding day! Their ceremony details were simple but they couldn't have been prettier... They had a pink petal aisle, wire sconces full of flowers, and amazing florals with lots of wild, beautiful greenery on their altar. Jessica and Daniel opted for an unplugged ceremony, meaning they asked their guests to put away their phones and cameras and simply be in the moment as they began their lives together as newlyweds. This is something we ALWAYS encourage our couples to do! It makes your ceremony so much more special and meaningful when everyone is present and not distracted... And you don't have to worry about phones/cameras in your photos. ;) This ceremony was extra special, because Daniel's dad was the officiant! Their reception was so romantic and dreamy, with lots of feminine, pastel details! Their reception tables were pretty simple, with ivory tablecloths, white lace runners, and pastel florals in mercury glass and gold vases. They also had the sweetest blush and gold place settings. My favorite details were the hanging florals above their head table! (You can see them if you look closely in the second photo.) I also loved the little cupcakes on their head table, as well as their elegant cocktail tables out on the lawn! And those florals! I can't get over them. A dreamy wedding calls for a cute, simple little white wedding cake! Theirs was perfect, with a few flowers on top and sweet pastel bunting hanging on the wooden backdrop behind it. Daniel's chocolate groom's cake had a gold antler on top... A simple yet elegant detail that really makes a statement!